Kristoff sprinted long and into the wind from reduced peloton of favorites to take fast and furious edition of the race. Alexander Kristoff (UAE-Team Emirates) launched a remarkable sprint to win Gent-Wevelgem after a day of scintillating racing, Sunday. John Degenkolb (Trek-Segafredo) came second, and Oliver Naesen (AG2R-La Mondiale) finished third. Despite the efforts of Deceuninck-Quick-Step in the final 20 kilometers to set up Elia Viviani, the Italian again leaves the race disappointed. Kristoff benefited from a good line in the final stretches, but also displayed awesome power, and simply rode away from the field. The Norweigan looked strong all race, attacking prior to the final climb of the Kemmelberg to ensure he made it over the top in touch with the leaders, and deservedly took one of the biggest wins of his career, which includes victories in Milano-Sanremo 2014 and the Tour of Flanders 2015. “I got the right wheel in the sprint and my form was good coming into the Flanders season,” said Kristoff, who must be considered a big contender for this year’s Ronde. The 252-kilometer classic is known as a race for sprinters, but the course is not without its difficulties, notably a succession of bergs in the second half, including a double ascent of the steep, cobbled Kemmelberg, and dirt sectors known as plugstreets. However, the final 35km of the race is flat and the race typically comes together for a charge into Wevelgem. The typical key factor influencing the race is strong winds coming in off the North Sea, bringing on splits, echelons, and, in 2015, riders being blown into ditches. Echelons did form through the race, but none that were pivotal to the result. Sagan, Trentin, Teunissen, and Theuns went clear from the group with 65km to go, and Rowe eventually bridged. This powerful quintet took nearly a minute’s advantage. They worked well together and for a time looked a real threat. 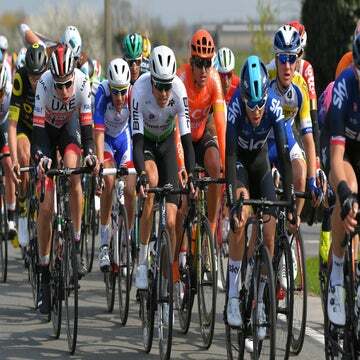 Zdenek Stybar (Deceunick-Quick-Step), Van Aert, and Kristoff attacked out of the peloton behind them as the final ascent of the Kemmelbeg approached, but the trio were soon neutralized. However, it was a sign of Kristoff’s confidence and form, as the final run-in to Wevelgem approached. With the bergs done and dusted, the race came back together, Quick-Step setting the pace and looking to set up Viviani. The strength in depth that the team has boasted in the latter stages of the racing this year so far was absent however, with only Stybar and Philippe Gilbert on the front. A flurry of attacks went and were soon brought back in the final 10km, with a strong headwind not favoring a small group. However, Amud Grondahl Jansen (Jumbo-Visma), Sebastian Langeveld (EF Education First), Jack Bauer (Mitchelton Scott) and Jasper Stuyven (Trek) went clear with 5km to go and built a small gap that looked like it may stick, before they too were inevitably brought back as Jumbo-Visma, Mitchelton-Scott, and Trek-Segafredo all took turns on the front, looking to set up their fastmen. As the race entered the final kilometers, the peloton of around 40 riders included nearly all the pre-race favorites, however, once Kristoff had picked his line and revved up his sprint, he was in a class of his own and won by several bike lengths.